Princess Nakaba of Senan and Prince Caesar of Belquat only married each other for the sake of peace between their two warring countries, yet the two develop feelings for each other while political forces threaten to tear their world apart. With Caesar’s departure to Belquat, the couple separates. Meanwhile, Nakaba manages to take control of Senan as ruler! But once Caesar’s father, King Guran, decides to break the peace treaty and invade Senan, what will Caesar do when he’s caught between his father and the woman he loves? Rei Toma has been drawing since childhood, but she only began drawing manga because of her graduation project in design school. When she drew a short-story manga, Help Me, Dentist, for the first time, it attracted a publisher's attention and she made her debut right away. Her magnificent art style became popular, and after she debuted as a manga artist, she became known as an illustrator for novels and video game character designs. 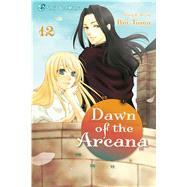 Her current manga series, Dawn of the Arcana, is her first long-running manga series, and it has been a hit in Japan, selling over a million copies.